Plan, plan, and plan. During your student’s IEP, all of the student’s important advocates are in one room. That is where you’ll be able to hash out the ins and outs of your role in his/her education. But once that is complete, continued connections with your student, his/her parents, and the special education team are crucial. Show the parents that you heartily accept and value their role as their child’s advocate. Sometimes teachers and parents can feel in competition with one another, but this need not be the case- especially when dealing with a special needs student. Encourage parent involvement even if it’s a struggle at first. Parents sometimes seem clueless or difficult. Winning them over means the difference between a child receiving necessary attention when completing at-home assignments or working on understanding difficult schoolwork. Give the parents a way to keep track of their student’s progress (via online or with some sort of assignment book that goes back and forth to school). Try having an open connection through email. Explain that your time is limited, but it’s important to touch base so ask them to email you once a week. You might also initiate an email with just one sentence to let them know the student’s progress. Something so small makes a huge difference. IEP’s are supposed to cover consultations and communication, but that doesn’t always happen. Parents often feel out of control and either don’t support their children at all or end up trying to fight with the teacher. The email gives them a sense of satisfaction and helps them feel like they’re doing something right. If they’re not, the email clears that up. Whenever possible, give the parents recommendations for other support and advocacy groups. 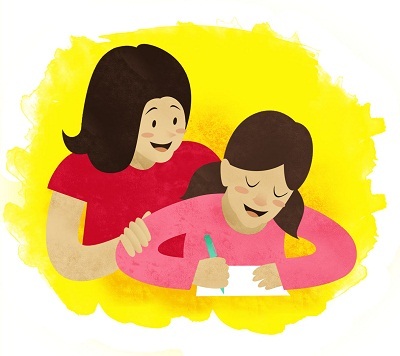 Involve the parent in curriculum work – when it centers on a subject that is of interest to him or her. Amy Dolley, author on How To Learn, asked parents what they wanted their child’s teacher to understand about them. She compiled a list of several items that included staying abreast of new studies regarding special needs, taking the time to stay for the entire IEP meetings, and be open to suggestions from the parents about how to help their child. No one expects you to be superhuman – it may feel that way when you are trying to oversee an entire classroom of children PLUS a special needs student – so find support and resources that keep you from burning out! As stated above, many children with Down syndrome are unable to express the depth and breadth of knowledge they have inside of them. This can lead to incredible amounts of frustration. As the teacher, there are several things you can do to help. Ask your student to show you what he/she means, rather than just ask it. Sit next to them when you communicate. Don’t stand over them. This is important with most people too, so it’s even more important with children that feel different. They don’t want to feel as if they’re being singled out. Develop a few signs that he/she can do to express needs and desires. You should use them when communicating back as well. Allow a bit of extra time to respond. Ask how their day is going. What have they done that they’re happy about? What have they done that they’re angry about? This makes them open up and feel comfortable with expressing themselves verbally. It will then carry over to feeling more comfortable expressing themselves on paper. Acknowledge and empathize when he/she is feeling frustrated at the inability to get the words out. Tap your mouth before you begin speaking to alert the student that he/she should watch your lips. Rituals can help too. For example, whenever you want to have a student answer a question, throw a softball to him/her to catch. However always make a judgment based on an individual basis. If that student is shy or sensitive, throwing a ball might be the worst thing you can do. Sometimes putting a sticky note on the desk or even touching the desk is quite enough. Besides giving them rituals. Find out what they like to do on a daily basis and put them in charge of it. It will make them feel successful so that they’ll gain confidence and want to succeed in other areas as well. Music is a great way to memorize procedures and routines. Create little rhymes for cleanup time or other times of day when students are expected to complete several tasks in a short amount of time. Great Tips, This is what I was looking for. Thank you Andrianes! Personal contact, including conferences, home visits, telephone calls, and curriculum nights or open houses, seems to be the most effective form of communication and may be among the most familiar. Great post, I found your post a resource for positive information, thanks for this great write-up. I think a tutor needs to adopt these techniques to communicate with students’ parents. Cause, they are spending most of their time with their parents and learning more than a teacher can learn in some stipulated time. So, if communication or interaction with parents is good, then a tutor can understand students issue and s/he can solve it accordingly. Bring a tutor myself, I’ve learnt quite a few things that may be of help to brighten up the lessons. Thank you!